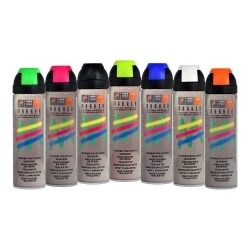 ACRYLIC PAINT SPRAY IN RAL COLOURS Professional 100% acrylic enamel for outdoors and indoors. Adheres to every surface and does NOT require a Primer. Packaging available: 400ml. SILICONE PAINT Special silicone enamel paint, heat resistant up to 600°C Available colours: Aluminium and Black. (Black resists up to 300° C) Packaging available: 400ml. ACRYLIC PAINT Very thick acrylic enamel for ferrous surfaces. In the colours: Light grey - Forge grey - Graphite. Packaging available: 400ml. ACRYLIC PAINT Acrylic enamel with special fluorescent effects In the colours: Yellow – Red – Magenta – Green Packaging available: 400ml. ACRYLIC PAINT Acrylic enamel with special metalised effects In the colours: Grey – Green – Red – Blue – Dark Blue – Black. Packaging available: 400ml. ACRYLIC PAINT Acrylic enamel available in the special versions: Silver - Rich Pale Gold - Ducat Gold - Copper Packaging available: 400ml. ACRYLIC PAINT Acrylic enamel with special mirror effect. In the colours: Gold Effect - Chrome Effect Packaging available: 400ml. ACRYLIC PAINT Acrylic enamel available in the following versions: Transparent: Glossy and Matt.Packaging available: 400ml Spray.